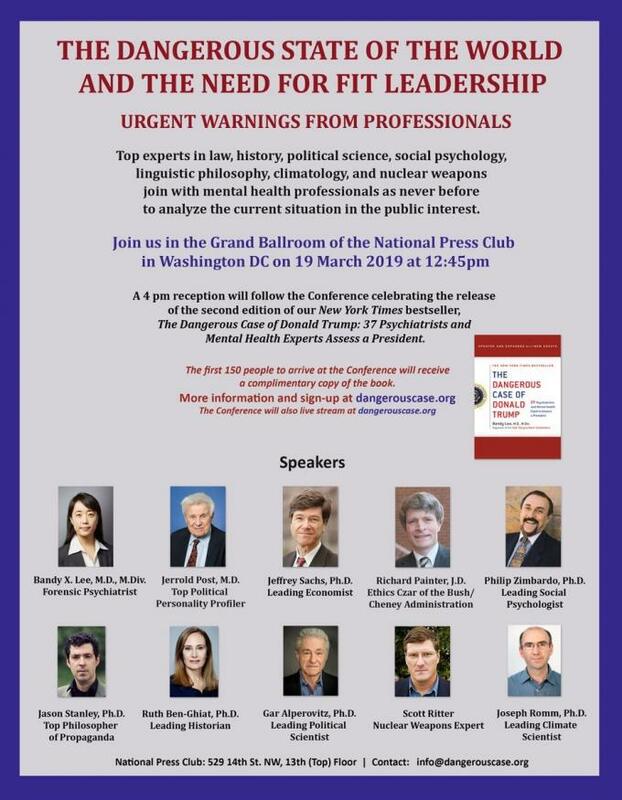 WASHINGTON - March 18, 2019 - PRLog -- The World Mental Health Coalition (WMHC) is an organization of mental health experts whose mission is to educate and empower the public and policymakers through scientific information about dangerousness and violence risk as this information pertains to government leaders. Its service is to provide consultation to government bodies upon request, so that they may proceed with their political processes in an informed way. For future prevention of dangers, it calls for mandatory fitness-for-duty assessments for all candidates of elected positions in countries with weapons of mass destruction. The technology and the extensive war-making powers that are available to our president, in his unstable state, make this perhaps one of the most precarious moments in the history of our nation and the world. Just when a correct appraisal is most urgent, expert voices are all but lacking in public discourse. We believe that clear analysis of a situation is the first step toward finding an informed and effective solution. The Conference also marks the launch day for the second edition of the New York Times bestseller THE DANGEROUS CASE OF DONALD TRUMP. Complimentary copies of the second edition will be available to media. The Conference is being organized by Drs. Bandy Lee, Jeffrey Sachs, and Jerrold Post (https://www2.gwu.edu/~icdrm/programs/facultybios/post.pdf), and sponsored by the World Mental Health Coalition (https://dangerouscase.org/our-mission/).